The exhibition “Hyperrealism. Movement Manifestations in Latvia” will be on show in the ARSENĀLS Exhibition Hall of the Latvian National Museum of Art in Riga from 3 March to 21 May 2017. It explores the arrival and development of hyperrealism in Latvia, encompassing the period from 1967 to 2017. Ritums Ivanovs is represented with nine works of different media. 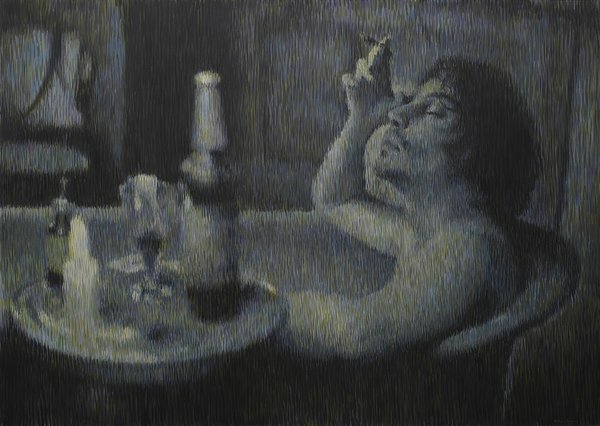 The peak of hyperrealism in Latvia in the 1970s coincided with the propagation of photorealism – a movement originating in the USA – in Europe, where it acquired the name – hyperrealism. Yet other names are also used for the movement: superrealism, cold realism, radical realism, sharp focus realism. Hyperrealism in figurative art depicts reality in a precise and detailed manner and imitates the particularities of photography. The mid-1960s, especially American art, saw the appearance of works which were created by transferring a reality captured in photographs onto a canvas. This trend was defined in 1969 by American art dealer and gallerist Louis K. Meisel. He called these artists – photorealists, thus also giving the name for the movement. Despite the unbelievably liberal atmosphere in all spheres of life in the 60s, painting from a photograph was almost like “going against the laws of artmaking”, wrote Meisel. American photorealism came under crossfire of attention of European viewers in 1972, when it was shown in the exhibition Documenta 5: Questioning Reality – Pictorial Worlds Today in Kassel. From this moment the new movement turned into an international phenomenon, information of which was also available in Latvia. Therefore, the curator of the exhibition analyses the works from Latvian art of the second half of the 20th century not as local, hermetic and isolated facts which during the Soviet period were only to be described as part of socialist realism, but more broadly, turning to the context of Western art and culture. Europe was surprised by the Americans’ colourful everyday life and the goods of consumer culture. Realistic, enlarged portraits, people in the street, shop windows, urban street scenes, close-ups of car bumpers and panel polish, bright chromed motorcycle parts, colourful toys, shiny plates, food and cutlery, neon signs, restaurants and petrol stations, phone booths and advertising boards. The clichés of American lifestyle, quotidian and banal subjects – altogether constituted a radical blow to the already worn abstract expressionism. In Latvia, hyperrealism was a logical development after the so-called socialist modernism and also marked the beginnings of postmodernism. Altogether, 170 works by more than 50 artists have been selected for the exhibition. Its core is formed from the contribution by the first and most consistent generation of Latvian hyperrealists – Imants Lancmanis, Guntis Strupulis, Līga Purmale, Miervaldis Polis, Māris Ārgalis. At the same time, it must be noted, that there are few pure examples of hyperrealism in Latvian art. The photorealist uses the camera and photograph to gather information. The photorealist uses a mechanical or semi-mechanical means to transfer the information to the canvas. The most popular method is projecting a slide onto the canvas. The other method – grid technique. The photorealist must have the technical ability to make the finished work appear photographic. The artist must have exhibited work as a photorealist by 1972 to be considered one of the central photorealists. The artist must have devoted at least five years to the development and exhibition of photorealist work. In Latvia, only the pioneers of hyperrealism of the 70s match such criteria. The ways artists have worked with images have changed over the 50 years – Louis K. Meisel also had to acknowledge that in later years. Already in the late 80s he admits the plurality of the movement: “There are as many techniques as there are photorealists”, wrote Louis K. Meisel in his book Photorealism (New York: Abradale Press, 1989, p. 15). In Latvia, in most cases hyperrealist approaches manifest themselves within other artistic movements. For example, in the 70s, the heyday of hyperrealism, a string of still-lifes appeared in Latvian art, which reached photographic mimesis of reality, yet artists painted them from nature and did not use photographs in their work. Hyperrealist methods can also be seen in examples of socialist realist art. The co-existence of pop art and hyperrealism is well known, similarly, hyperrealism often manifests itself in surrealism. At the turn of the 20th and 21st centuries, hyperrealism saw the revolution of modern technologies and immediately turned to the use of digital cameras, computers and online resources, never ceasing to surprise with exaggerated aspects of realism. Although hyperrealism of the digital era is mostly connected to conceptualism. Mimesis of photographic reality does not stop at aesthetic considerations, its conceptual goals are much more important. 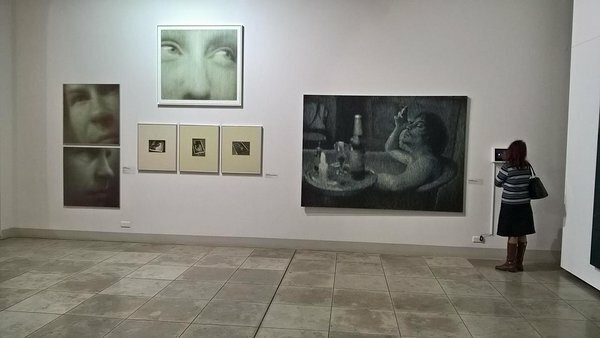 The exhibition includes works from the Latvian National Museum of Art, Tartu Art Museum, the ABLV Bank Collection for the Latvian Museum of Contemporary Art, Māksla XO Gallery and Riga Gallery collections, as well as the private collections of Zuzāns family, Irina and Māris Vītols, Vilis Dambiņš, Zaiga and Māris Gailis, Mārtiņš Knipšis, Anita Vanaga, artists’ private collections etc. Exhibition is a part of Latvia’s centenary project Ten Episodes of Latvian Art in the Second Half of the 20th Century.